Introducing Pam Lamonica. Pam is inspired by her local, North Carolina, sights, architecture and history. She creates stunning cross stitch patterns that are truly works of art! Her patterns are available in her Etsy shop, Lamonica Designs, as well as on her web site, lamonicadesigns.com. My name is Pam LaMonica. I am married. I have 3 children and 2 grandchildren. 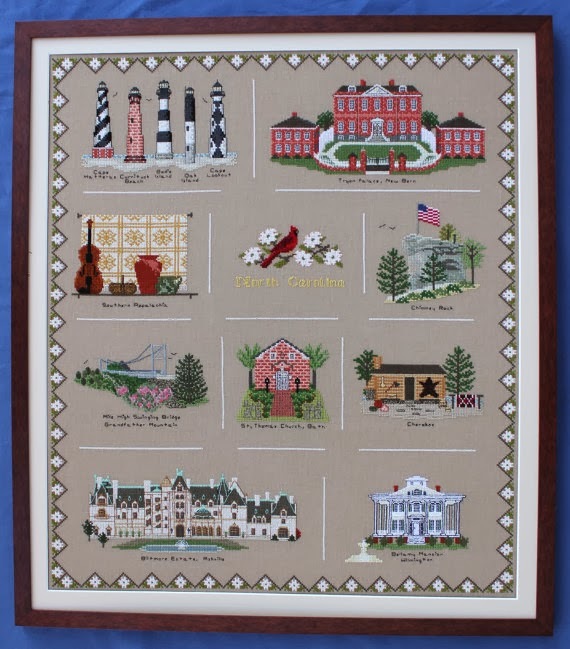 I am originally from Hanover, PA. My husband and I moved to Southport, NC about 8 years ago. Southport is a small, beautiful waterfront town about an hour north of Myrtle Beach, SC. It was a fishing town at one time, filled with Victorian homes and turn of the century cottages and lots of majestic live oaks. I create cross stitch patterns. I specialize in local and North Carolina patterns. This state and town are my inspiration. From mountains to beaches and all the historic sites, I have plenty of ideas to choose from. This is my favorite craft. I learned to do it while in school for radiology many years ago. When I moved here, I wanted some local patterns to stitch for my guest rooms. I stopped in at our local needlework shop and found out there were no patterns available. So I decided to create my own. That's when the creative bug took hold. I spoke to the owner of Angelwing Needle Arts, Donna Bennett. She has been my encouragement, my mentor. I couldn't have done it without her. She has been carrying my patterns in her shop since 2009. My husband and I love antiquing and touring historic sites and homes. We enjoy visiting flea markets and thrift shops. I love to reuse items and am always happy to see artists reusing materials. My favorite materials are linen and floss, of course. I also like to have fun now and then with over dyes and beads. Is cross stitch a hobby or business? Well, some where in between. My hope some day is for this to be large enough a business that I could do this full time. A typical day for me during the week consists of taking my 82 year young mom to Curves three mornings a week, then running errands and spending some time with my husband. After dinner, It's stitching time for me!! On the weekends I work at the local hospital as an ultrasound technologist. My ideal day is always antiquing or touring someplace new, followed by a wonderful dinner and a glass of wine while enjoying a beautiful view! How do you design a cross stitch pattern? Well, I do have a computer program. I start with an idea of what I would like to do. I take pictures of the area I will be working with and start with a blank screen. Then, I just start building the pattern, assigning each block a colored stitch. I just keep tweeking things until I think it looks right. Of course, it never ends up the way I originally thought it would. It kind of takes on a life of it's own and I just go with it! It may take a few weeks to a month to design. Then I print out the chart and start stitching. When it's finished, I wash it, press it, stretch it and frame it. I have someone else photograph it. Then I fix any mistakes I found on the chart while stitching it, add the backstitch instructions and get everything ready to go to print. The time of the entire process depends on the size and difficulty of the pattern. Yacht Basin II took about 9 months. That was my most difficult and time consuming one. I am most proud of the very first pattern I created. Bay Street. I had to figure out everything, from designing to stretching and framing, getting it photographed and printed, and packaging. I have had a few patterns that didn't sell well. I brought them home and I actually have one hanging over my fireplace. It reminds me to never be afraid of trying something new. Whether it's an idea or technique, it's okay to fail now and then. Just learn from it and move forward. What are your business/artistic goals for 2014? My goals this year are to create smaller, easier patterns. So many people today are busy and don't have much time to stitch. I am currently working on what locals call the "Crimes of the Heart House." It's a beautiful Victorian with pinks, blue and purple. Spring colors! It's called that because Hollywood used it in the movie Crimes of the Heart in the 1980's and the name stuck. I'm also going to do some small Christmas patterns that could be used for ornaments. I also have requests for a small sampler of historic Winston Salem NC. 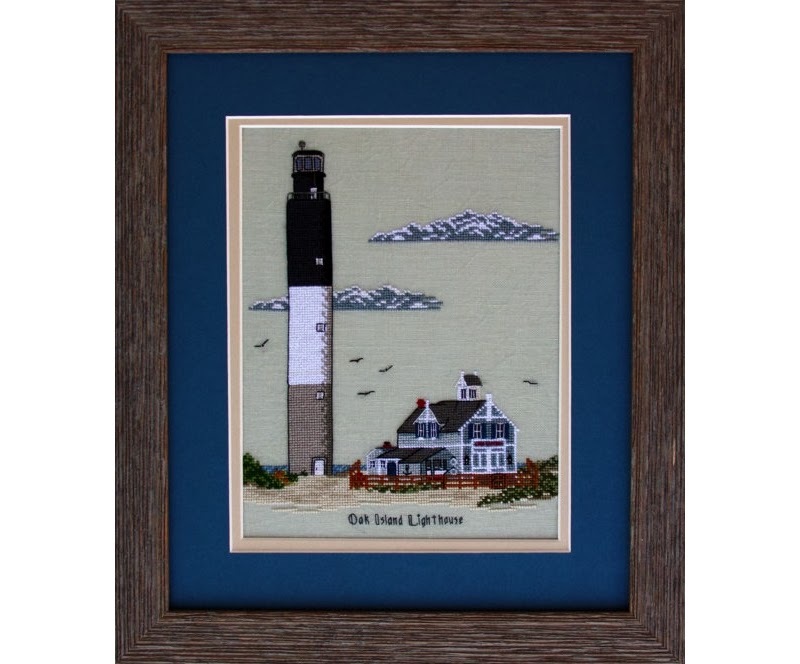 Featured Artist: Pam Lamonica - Inspired by her local, North Carolina, sights, architecture and history, Pam creates stunning cross stitch patterns that are truly works of art!